The term ‘stress’, as any occupational health (OH) professional will know, is widely abused and frequently misunderstood in the workplace. More often than not it is used by employers and managers as an easy excuse for ignoring bad management practices or wider environmental or cultural failings. Yet mental ill health at work, in all its shapes and forms, is nevertheless an all too real problem that costs the economy, as well as individuals, dear. According to the government’s mental health at work strategy – New Horizons, – which was unveiled in December 2009, at any one time, just over 20% of working-age women and 17% of working-age men are affected by stress and anxiety. One in six adults will suffer from a mental health problem at some point in their lives. Mental ill health is also the most common reason for claiming health-related benefits, costing the economy between £30bn and £40bn a year through lost productivity, sick pay and NHS treatment. The new document comprises a UK-wide national mental health and employment strategy, a cross-governmental delivery plan, and commitments to action (see box below) that span 11 departments. Roll-out of a new network of mental health co-ordinators within Jobcentre Plus to better co-ordinate health and employment support at local level. The piloting of the NHS Plus-run workplace health helpline for SMEs. Ministers to examine how Access to Work programme could be widened to help more people with mental health conditions to obtain and stay in work. Ministerial board to be set up across key government departments involved with the strategy to establish high-level oversight of progress. Department of Health to offer support and advice on mental health to government departments and other statutory agencies. A New Horizons Ministerial Advisory Group will be set up to examine inequalities and mental health, chaired by the minister of state for care services (Phil Hope). New mental health co-ordinators to establish and maintain local networks between employment and health and social services workers. All advisers within Jobcentre Plus and other welfare-to-work providers to receive skills-based training on mental health issues. Jobcentre Plus and other providers to offer greater privacy for those who feel uncomfortable discussing personal issues in an open-plan environment. Fit-note guidance to emphasise that a person does not need to be “fully recovered” to return to some work. The government should set up a “single hub” for support and advice on best practice, do more to support national anti-stigma campaigns and encourage the commissioning of mental health “first aid” or related training for employers, following the examples of Scotland and Wales. The government should promote better sharing of good employment practice in relation to mental health among employers and ensure the principles and example of good OH practice in recruiting and retaining people with mental health conditions are widely disseminated, “so that recruiting managers without access to occupational health can use it as a self-help resource”. The government should require public sector employers to review their OH arrangements in relation to the recruitment of people with mental health conditions to eradicate unjustified discrimination, and outlaw “inappropriate” use of pre-employment health checks, with checks only being done after, and independently of an evaluation of the person’s capacity to perform the job, to ascertain any adjustments they might require and to check they meet the essential health requirements of that job. Employers need to recognise that while, as with physical conditions or disabilities, staff may require adaptations to workplaces or extra support, sometimes the obstacles to work are less tangible. Employers and managers need to recognise that mental health conditions fluctuate, can affect someone’s social rather than physical world of work, may not be immediately obvious, and appropriate employment can actively improve mental health and protect against relapse. The government needs to build more effective links between the Department for Work and Pensions (DWP) and health and social services. Welfare-to-work services need to better accommodate the needs of people with mental health conditions, such as by improving training and continuity of advisers. Health and social services need to improve the extent to which they address the employment needs of people with mental health conditions – for instance, by including vocational issues within assessments and consultations and treatment and support plans. The DWP and health and social services need to improve the day-to-day support provided to people with mental health conditions and their potential employers – for example, in providing better information. More work needs to be done to tackle misunderstandings among employers, employees and the services that support them. Employment specialists should be embedded into primary care and secondary mental health teams to ensure better, more integrated vocational and employment support. The DWP should examine how better to resource services to provide more flexible and integrated assistance – for example, through the reform of Access to Work. To ease the transition from benefits to work, the DWP should make available time-limited internships in parallel with job searches for those with mental health issues who need to familiarise themselves with the world of work and build up time in the workplace. Health and social services should routinely monitor employment outcomes for the people they serve, with the DWP regularly monitoring service provision and outcomes for the people they serve with a mental health condition. Service provision and employment outcomes for people with mental health conditions should form part of the core commissioning criteria. Both documents are a central part of the government’s response to national director for health and work Dame Carol Black’s vision for the future of workplace health, with the government’s over-arching aim being to have radically narrowed the gap between the employment rate of people in contact with secondary mental health services and those of people with disabilities in general by 2025. The strategy therefore needs to be seen as another piece of the puzzle ministers have been putting together to tackle workplace ill health in the wake of the Black recommendations, including the launch of a new ‘fit note’ to replace the current GP sick note, a Fit for Work service, the reform of incapacity benefits, and a dedicated workplace health helpline for small and medium-sized enterprises (SMEs). In fact, the unveiling of the NHS Plus-run helpline was even bundled into the launch of the strategy, such is the way ministers see all the different elements meshing together to create a larger whole. The strategy also needs to be seen in the context of guidance from the National Institute for Health and Clinical Excellence (Nice) published in November promoting mental health and wellbeing in the workplace. As Nice made clear, tackling mental ill health in the workplace effectively is all too often simply about careful, sensible, ­common­-sense management and intervention, including the promotion of a culture of participation, equality and fairness based on open communication and inclusion, creating better awareness and understanding of mental wellbeing, plus reducing the potential for discrimination and stigma. Nice also urged employers to put in place better systems for assessing and monitoring mental wellbeing, including employee attitude surveys, information on absence rates, staff turnover and investment in training and development. Finally, it called for more flexible working (if practicable) and for line managers to be given more freedom to promote the mental wellbeing of employees through supportive leadership style and management practices. The New Horizons strategy document builds on these recommendations, suggesting a range of responses, including the dissemination of good OH practice in recruiting and retaining people with mental health conditions; that public sector employers review their OH arrangements in relation to the recruitment of people with mental health conditions; and that the “inappropriate” use of pre-employment health checks be outlawed. Mental ill health is one of the major reasons why people are not able to be at work, Black tells Occupational Health, which is why making this strategy work is so important. And while OH professionals will have an important role to play as champions and educators, ultimately, it is the attitudes and effectiveness of line managers in managing people and mental ill health that will make the difference, adds Eugene Farrell, business manager at Axa ICAS. There is also growing recognition that often it is not the workplace per se that may be the stressor, but family life or financial concerns – but a badly managed workplace can in such circumstances be an exacerbator or a “tipping point”. The test now for the government is whether it can pull together to deliver the important promises made in the strategy, particularly in a climate of very tight public finances, said Steve Shrubb, director of the Mental Health Network, in the wake of the launch. Future governments, of whatever hue, will need to use the strategy as “a baseline for developing better mental health services and creating a healthier, more productive society”, suggested Paul Farmer, chief executive of the charity Mind. And the emphasis on the relationship between work, the workplace and mental health was also welcomed, argued Dr Andrew McCulloch, chief executive of the Mental Health Foundation. “Without good mental health, our relationships, jobs, and physical health all suffer. We need to get to grips with the financial and social burden that poor mental health places on the NHS and society as a whole, and the way to do this is by promoting the mental health of everyone,” he said. 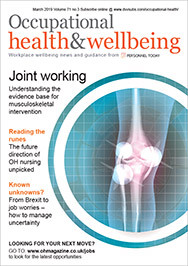 For OH professionals, work still needs to be done to get employers, GPs and even other health professionals to recognise that mental ill health needn’t be a barrier to returning to work, argues Sandra Neylon, director of OH and vocational rehabilitation provider Neylon Occupational Health. “When I speak at conferences I am sometimes shocked at the number of health professionals who still do not think they should do anything until they have had the note through from the GP saying an employee can come back to work,” she says. “OH needs to be helping to spread the word, but I am worried that OH has still not fully got its own house in order. Students, for example, need to be given practical advice on how to do rehabilitation and how to bring people back to work early, but I do not know how much they get on this in their degree. “OH professionals have to embrace it and they have to help managers to embrace it. It is about allowing people to come back to work and supporting them back into work. It is about helping managers to recognise that mental health is every bit as important as physical health, and not necessarily any more difficult to deal with. Someone with, say, bipolar disorder should not be more difficult to deal with than someone who has a broken leg,” she adds. In practical terms, OH can play a central role in showing managers and HR departments how to speak to employees, and show them what questions to ask and how to ask them, she recommends. “This is not going to convert everybody, but I do think it is going to have a positive impact, particularly on how managers and employers perceive and deal with mental ill health. And it is not just about health issues per se – it may also be important in helping employers recognise the need to deal with physical health issues so they don’t then lead into mental health issues,” Neylon says.